Fans packed into the Pepsi Grandstand Wednesday night at the Missouri State Fair for the Southern Uprising Tour featuring The Outlaws, The Marshall Tucker Band, Charlie Daniels Band and Travis Tritt. 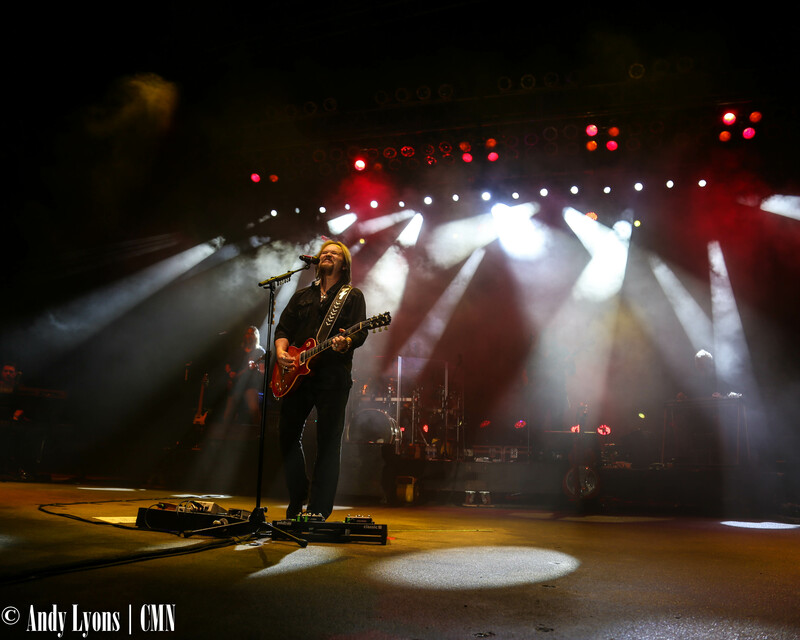 The tour was scheduled to play last year’s Fair, however thunderstorms kept the southern rockers from taking the stage. Wednesday’s show went on despite some inclement weather, although Charlie Daniels’ set was cut short and a rain delay left the track seating area a massive puddle of ankle deep water. Fans didn’t seem to mind, staying to sing along and dance as rain delayed the show nearly 30 minutes. Last week, Daniels took some time to speak to CMN about what it means to still be performing at 82 years old. Daniels’ style of music can’t be lumped into one hard genre, as it touches the fringes of southern rock, country, and gospel. With a theme of “Come Home” for the second year in a row, the Missouri State Fair focuses on family entertainment and bring people together. His career has spanned nearly 60 years, Daniels has noticed his crowd now includes three or sometimes four generations in the seats. The 2016 inductee into the Country Music Hall of Fame also said music is a way to bring people together in a time that is so divided. He acknowledged not everyone will like every song, but with the diverse setlist something is bound to catch on. Wednesday’s show kicked off with The Outlaws getting people out of their chairs and singing along. The group finished their set with a cover of “Ghost Riders in the Sky” and their hit song “Green Grass & High Tides.” Both songs had fans moving, with the extended breakdown of “Green Grass” getting the band a standing ovation as it finished. The Marshall Tucker Band was similar, with extended jams and vocalist Doug Gray on the tambourine while the group took turns on solos – including saxophonist Marcus James Henderson. Guitarists Chris Hicks and Rick Willis did a good job of working the crowd, and Hicks took on the task of vocals throughout the set. Daniels hit the stage with clouds looming overhead, but that didn’t stop the legend. With his fiddle in his hands, Daniels took command of the crowd right away. His showmanship not diminished by his age, the entire Grandstand was on their feet for his set, until the rain hit. As a drizzle started, fans moved up the Grandstand to be under the overhand and off the track to underneath the Grandstand, packing the entryways to see the set. Daniels played a cover of Johnny Cash’s “Folsom Prison Blues” and during the line “watch him die,” Daniels hollered “like a Kansas Jayhawk fan!” which got a roar from the Missouri fan base in attendance. The rain intensified, as crew members were working to cover electronics on stage Daniels told the crowd, “it’s wet and dangerous up here, I told them I won’t leave until I play this song,” and immediately went into legendary track “Devil Went Down to Georgia” to finish his set. With a delay before his set giving fans a chance to imbibe some more adult beverages, Tritt hit the stage hard and heavy. Fans on the track level were in ankle deep mud but that didn’t stop them from clapping and singing along as he pulled from a massive catalog of music – including some very famous covers. The show embodied what the Missouri State Fair is all about. Fans of all ages were there enjoying themselves, hands in the air and singing along. Having legends on the stage performing music shared amongst multiple generations of families made for one of the most memorable nights in recent memory at the Missouri State Fair.